Forty-five years ago, a man landed on the moon for the first time. Understandably, he was a little nervous. 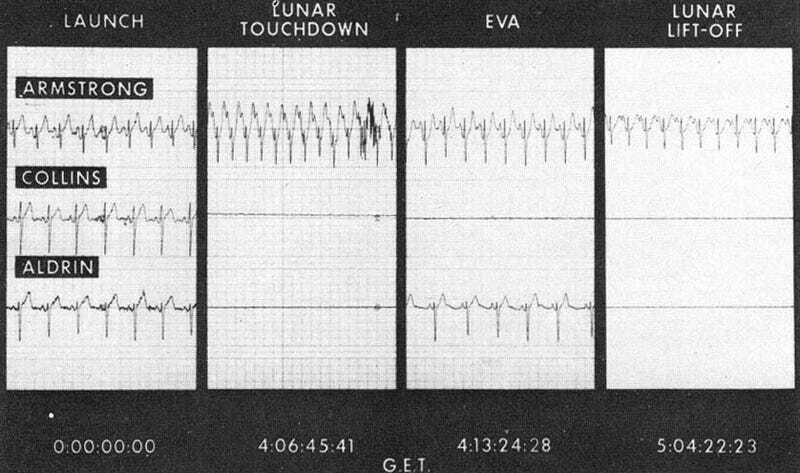 Neil Armstrong's heart raced to 160 beats per minute as the lunar vehicle touched down on the moon's surface. But as he made that great leap for mankind and walked around the moon, his heart steadied and slowed. The rhythm of his heartbeat, which Berlin-based singer Louise Gold captured off of a radio program, become the basis for her cover of John Lennon's "Oh My Love." Gold had long been fascinated by space, so she went looking for other cosmic sounds to incorporate into her work. At the library, she found the "Symphony of the Planets," a now out-of-print collection of recordings from NASA's Voyager unmanned probes. There is no sound in the vacuum of space, of course, but Voyager 1 and 2 picked up the electromagnetic emissions of passing planets. Those electromagnetic waves were translated into sound waves, the whirring and whizzing you can hear looped into Gold's version of "Oh My Love." Lennon's original song sits in the space between two lovers, small and intimate. In Gold's reimagined cover, that small intimacy exists in the vast grandeur of space. Listen to it below.